Financial planning is a lifelong endeavor, but people often seek out investment advice that doesn’t fit their current stage in life. When it comes to saving for retirement, most Americans invest and manage those savings for six decades or longer. It’s important to consider how your resources and risk tolerance change as you move though different life stages. Saving for your retirement looks very different at age 30 compared to age 60. As financial advisors, we strive to help our clients develop retirement savings plans that are appropriate to the changing circumstances they face at every age. Here are some areas that we consider when giving age-appropriate retirement advice. In the past, investment experts advocated the “100 Rule,” which called for subtracting your age from 100 to determine how much of your assets should be invested in stocks. For example, this rule called for 25-years old to hold 75% of assets in stocks or “riskier” investments and 25% in bonds, CDs, equities or other low-risk investments. Now this has been updated to the “110 or 120 Rule” because Americans are living longer, making it extremely important to generate enough money to last throughout retirement. While this rule is useful for general guidance, it’s important to look at your particular situation and develop a more nuanced investment mix that is more closely aligned with your retirement savings goals and risk comfort level. Take full advantage of your employer’s contribution by investing 10 to 15% of your salary in your office retirement plan in your 30s. Investing in a home or rental property is a good idea, provided you will be able to keep the real estate for at least five years. When you compare long-term investment returnson stocks and bonds, stocks vastly outperform cash and bond investments over time. You have decades to potentially make up any temporary losses in the stock market, so invest as aggressively in equities as your risk comfort level allows. By the time you reach your 40s, you need to be saving as much as possible for your retirement. Now is the time to max out your retirement contributions by investing the full $18,000 allowed each year. Investing in a tax-advantaged Roth IRA in addition to your 401(k) or 403(b) will help boost your retirement savings. It’s the right time to start investing in some lower-risk bonds too, unless you have been neglecting your retirement savings plan. A financial advisor can help determine the ideal investment mix to achieve your savings goals while maintaining an acceptable risk level. When you are in your last decades of saving for retirement, it is time to start rebalancing your portfolio. Consider moving your funds into bonds and money markets. A financial advisor can help you compile a comprehensive financial profile, assessing all your funding sources to figure out your ideal investment mix to provide income throughout your retirement. 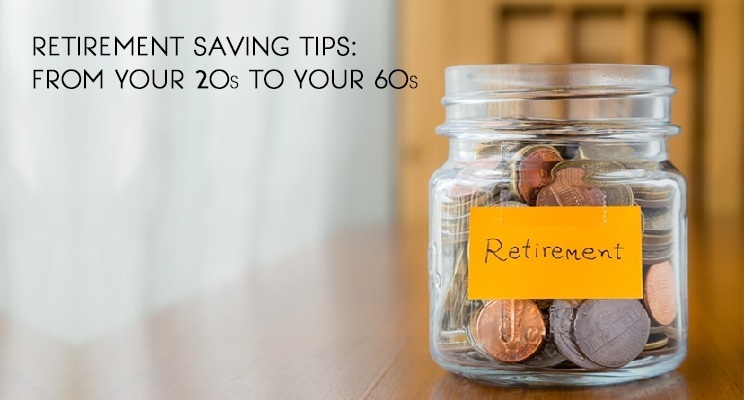 We suggest using the above tips as starting points to saving for retirement throughout the different life stages. However, regardless of age, everyone can benefit from a personalized retirement plan. As financial professionals, we are available to help you figure out the ideal asset allocation for your retirement savings plan at your stage of life. Please contact us for a complimentary consultation.